The Ionica receive converters can be used on the amateur band with no modification, however improvement with small mods are worthwile. Recent information has identified the pin out of the 9way D type connector. Note the +ve supply regulator to the GaAs fets does not become active unless -12v is present. Shown to the left is a close up of the part of the front end where the Pin diode switching for the noise source is. I have removed the Pin diode that is connected to the main RF stripline ( by the screw) and cut the tracks to the other diode and its bias arrangement next to the coupling capacitor. Rx noisefigure improves noticably. 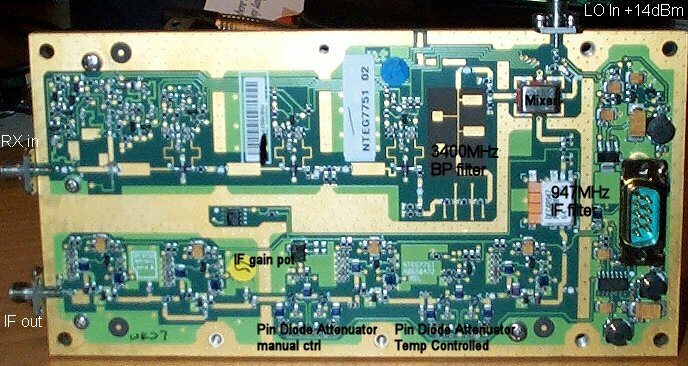 The IF filter (947MHz) and probably the gain stages will need to be bypassed if any amateur band IF is planned. 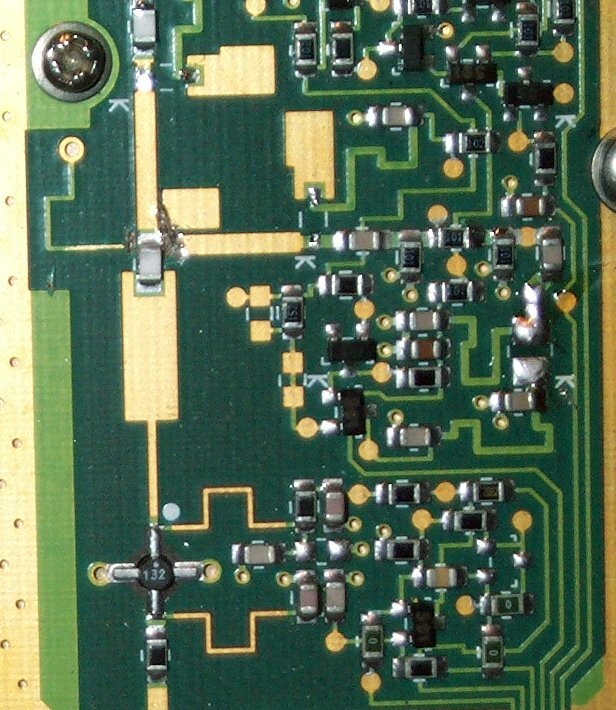 If a first IF is planned below 900MHz, it is likley that the image response of the converter will be poor. External filtering and an LNA would be a good idea in this case. The front end of the Ionica receiver works well enough to be a viable receiver without a pre-amplifier, though a significantly better system noise performance is acheived with a good Low Noise Amplifier.